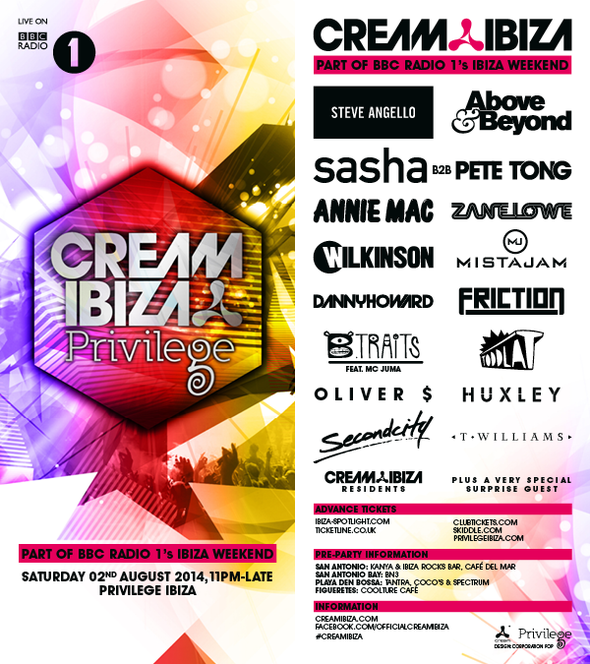 BBC Radio 1 in Ibiza returns this August and Cream recently announced that once again BBC Radio 1 will be broadcasting live from Cream at Privilege for a special live extended Essential Mix on Saturday 2 August. Following last year’s sell out success, the event will feature some of the biggest names in dance music on what is usually the busiest weekend on the island. 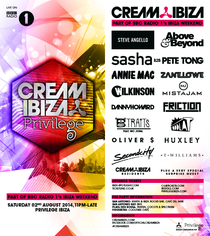 This year’s line-up will include performances from Steve Angello, Above & Beyond, Sasha and Pete Tong performing back to back, Annie Mac, Zane Lowe, Wilkinson, MistaJam, Danny Howard, Friction, B.Traits featuring MC Juma, Toddla T, Oliver $, Huxley, Second City, T.Williams plus a special guest still to be announced. BBC Radio 1 will be broadcasting live from the event between midnight-5am (BST) / 1am – 6am (CEST) available to listen to on www.bbc.co.uk/radio1. As usual, this event is expected to sell out and a limited number of early bird tickets are on sale now from www.ibiza-spotlight.co.uk.